Since July 2017 PCA has made numerous visits to Bristol to undertake targeted phases of archaeological investigation during the reconfiguration of the Temple Circus Gyratory system close to Bristol Broadmead station, recording the medieval and post-medieval development of the area. As the scheme nears completion we will shortly be returning to undertake the final phase of archaeological investigation, focussing primarily on the detailed recording of a southern section of the Portwall, the 13th-century city wall. Click here for more information on the scheme. It has become a bit of a PCA tradition to host four Newcastle university students over the Easter vacation, in our London offices. 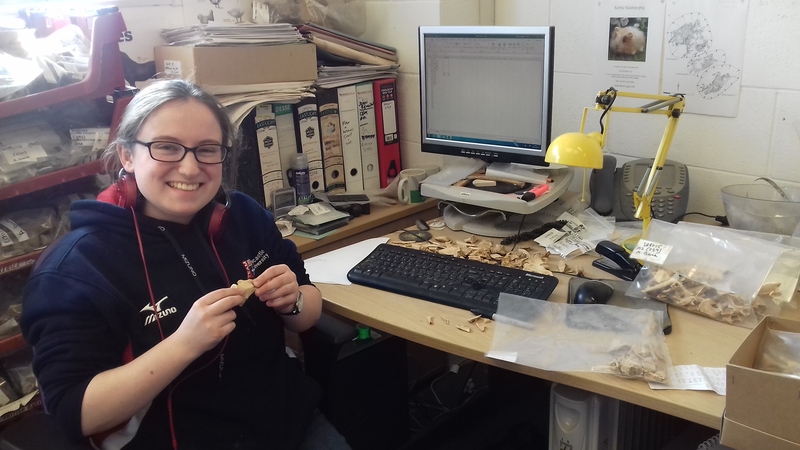 This year we have been joined by Abbie, who is assisting with processing and sorting of environmental samples, and Ellie who has been recording details such as root etching on animal bones. 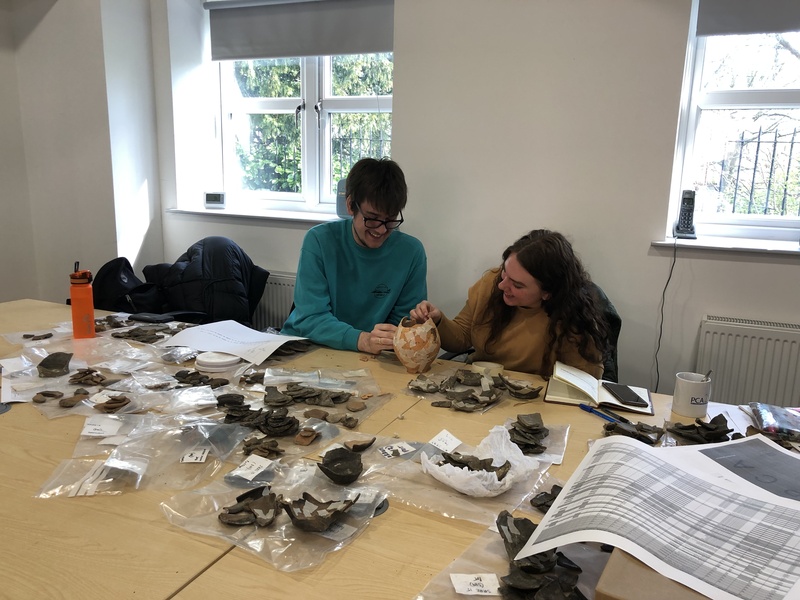 We are also delighted to welcome Ella and Rowan to our new Chester-le-Street offices – they have been looking for (and finding) cross-context joins across a Roman pottery assemblage and sticking the pieces together. All are working really hard and hopefully enjoying their time with us too. 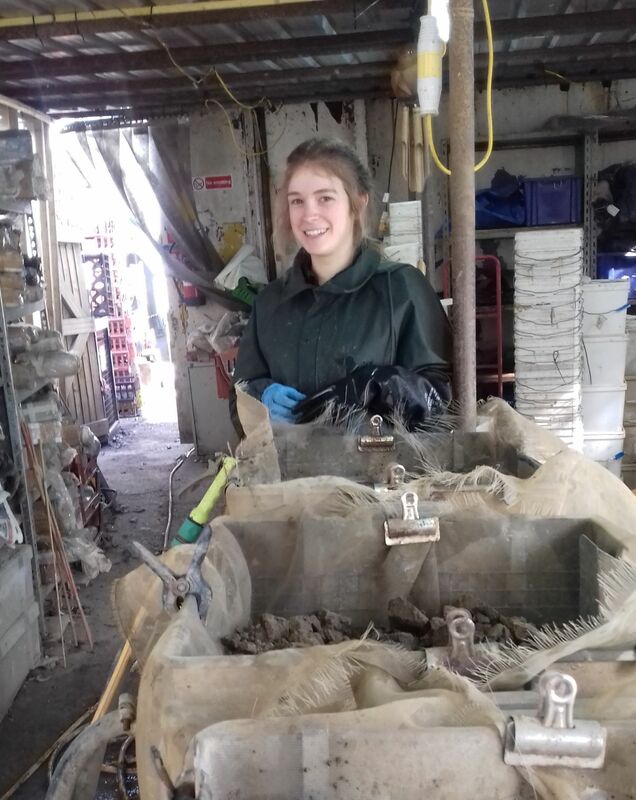 Look out for two more of our student placements in a couple of weeks’ time. Saturday the 16th March saw the 56th London and Middlesex Archaeological Society Conference, with an fabulous turn-out and full lecture hall. 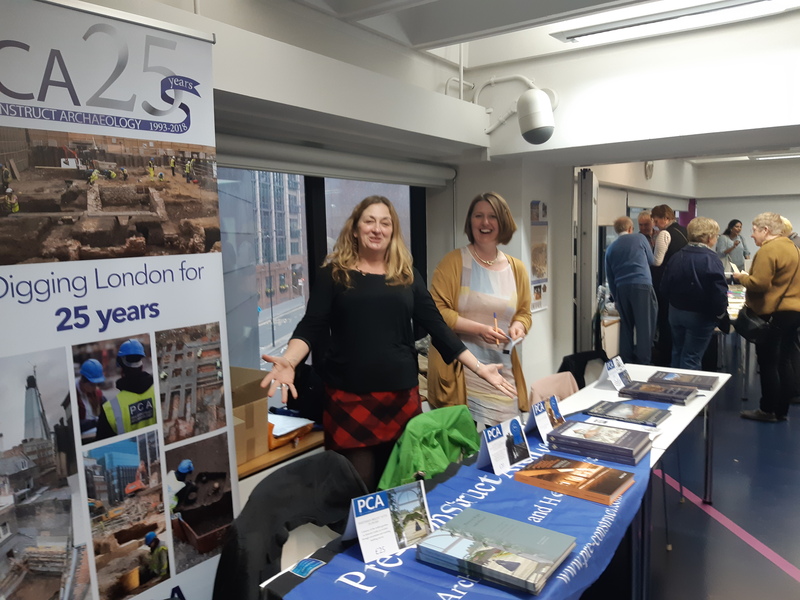 PCA were well represented this year with no less than three speakers, an exceptionally successful stand and bookstall, run by Vicki Ridgeway and Becky Haslam, and many staff turning out to provide support and enjoy the lectures. Shane Maher opened the day with his excellent presentation on recent excavations at on the edge of the City at 56-62 Moorgate, with its complex sequence of Roman clay and timber buildings and tantalising hints of industrial activity. Later in the morning we were treated to Joe Brook’s absorbing talk on recent excavations at the Adrian Boult Music centre. Focussed on the Abbey’s kitchen range, Joe further put the findings into context with highlights of our previous excavations in and around the Abbey complex. The afternoon session, inspired by a forthcoming exhibition on Secret Rivers of London at the Docklands Museum, focused on the Thames and its tributaries. Barry Bishop provided a fascinating tour of the River Wandle in prehistory from its earliest Palaeolithic origins to the Iron Age. 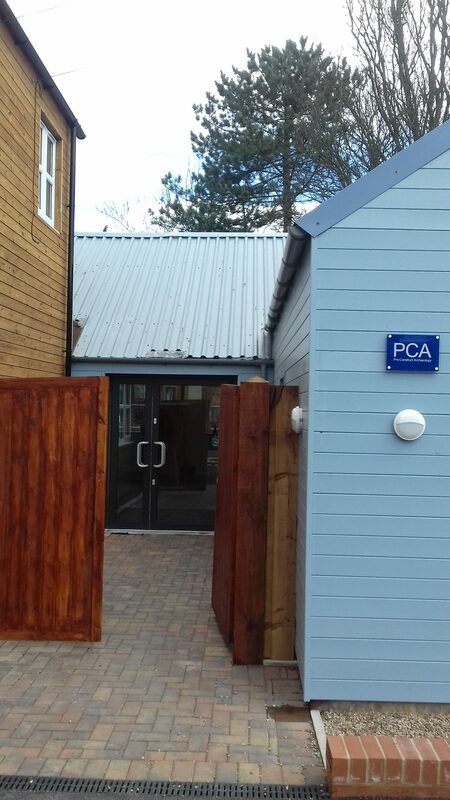 PCA Durham has just completed relocation to newly-refurbished premises in Chester-le-Street; after nearly 17 years in their previous offices this was quite an undertaking. The new premises have had a long and chequered history and have been used for a variety of purposes over the years, with one part of the building originally constructed as a rope works. The building has been renamed The Ropeworks to reflect this original use. In recent years the building had fallen into some disrepair and the refurbishment has transformed the premises both externally and internally, with the space designed for the wide variety of requirements of an archaeological unit. As soon as everything is in place we will post further pictures of our lovely new office space. PCA's Book on Awards Shortlist! PCA is delighted that the monograph ‘An Immense and Exceedingly Commodious Goods Station; The Archaeology and History of the Great Northern Railway's Goods Yard at King's Cross, 1849 to the Present Day’ has been shortlisted for the Transport History Book of the Year award 2019, presented by the Railway and Canal Historical Society. Well done to all involved and good luck for the next stage! 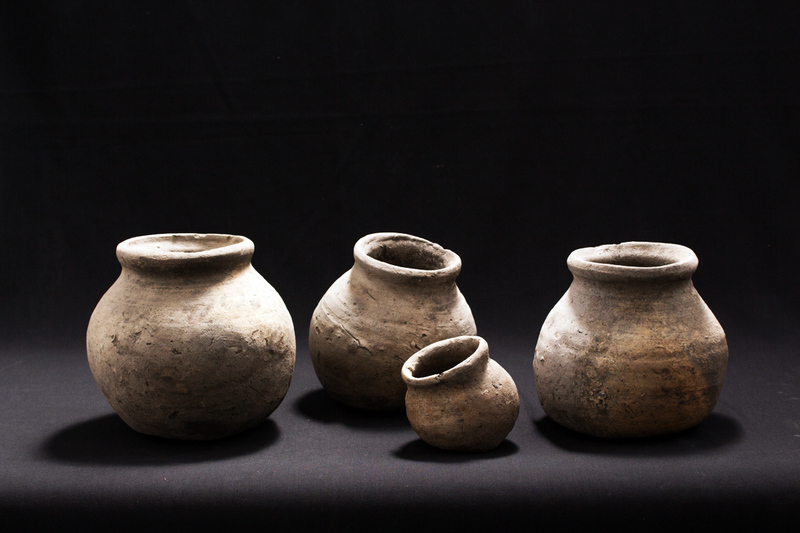 The Council for British Archaeology – CBA (London) arranged a special visit with an introduction to the archaeology by PCA Director Peter Moore on Saturday 9th February. 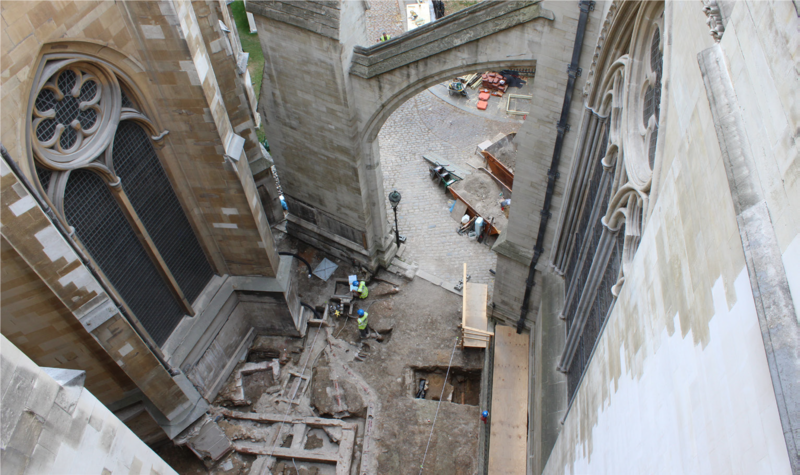 Peter described the discoveries excavated by PCA: the external corner where the new access tower has been built yielded everything from monastic burials to shop foundations, and centuries of surprises were extracted from thousands of bags of dust retrieved from beneath the triforium floor. The new Queen’s Diamond Jubilee Galleries in the triforium space of Westminster Abbey are simply stunning. This once hidden section of the Abbey shows off its treasures brilliantly, and all has been enhanced by the archaeological efforts that have helped create the galleries. This event was popular and fully booked, so if you were one of the lucky ticket holders, we hope you enjoyed this fascinating visit! An exhibition was held on Saturday 19th January presenting the archaeological findings from PCA’s site at the Boleyn Ground, formerly West Ham Football Club’s ground, in London Borough of Newham. 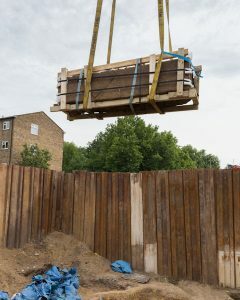 Click the button for a news article about the site in the Newham Recorder. 2019 Civic Trust Awards Winner and 2019 Civic Trust AABC Conservation Awards Winner! Kicking off the new year with some great news! PCA was part of a winning team selected for an award for their work on the Westminster Abbey Triforium project. The project was nominated as a 2019 Civic Trust Awards Winner @CTAwards as well as a 2019 Civic Trust AABC Conservation Awards Winner @CTAConservation. The awards were announced at the Civic Trust Awards ceremony on the 1st March 2019. A full list of the winners and further details of the awards can be found via the link below. Winter bee boles discovered in tudor cellars underneath the Painted Hall in Greenwich. View looking southwest across Painted Hall undercroft and 1510-1550 tiled floor. 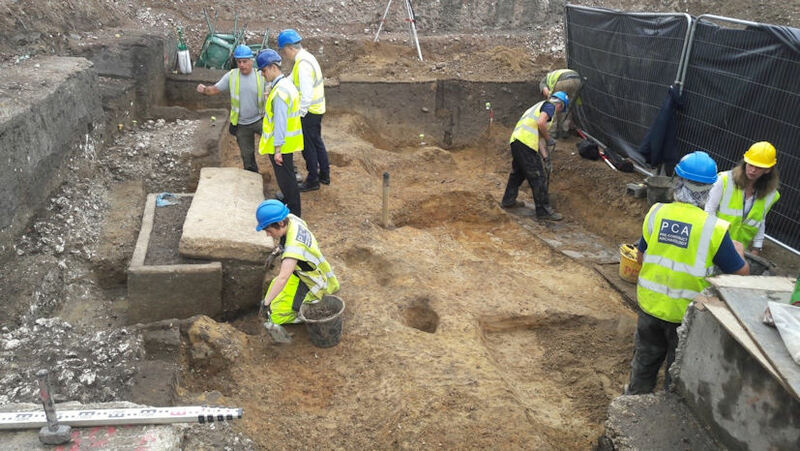 Despite several previous archaeological investigations in the vicinity of the Tudor palace, which once stood in the area now covered by the former Royal Naval College and National Maritime Museum, Greenwich, very little physical evidence for it has actually been recovered. Instead a very interesting discovery was made. A Watching Brief by Tanya Jones of Pre-Construct Archaeology Limited was anticipated to continue this trend during an restoration works at the Painted Hall, for the Greenwich Foundation. The site lies within the grounds of the Palace of Placentia, originally constructed in 1443 and subsequently enlarged and altered throughout the Tudor period. It was mostly demolished by Charles II. The watching brief monitored the lifting of floors and their make-up deposits and initially found 18th and 19th walls and flues, but then a sunken 15m2 room was found towards the north-eastern end of the Painted Hall undercroft. 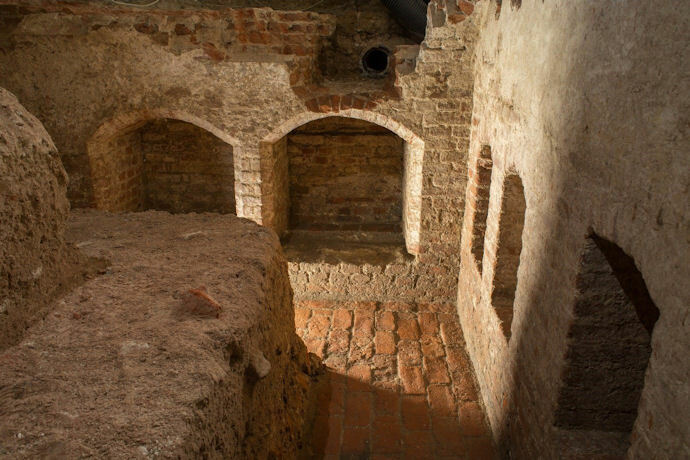 Analysis confirmed that the three extant walls of the sunken room were constructed from small Henrician bricks while the neatly laid floor was constructed of rows of over 100 tiles and 100 paving bricks. The preservation of glazes on the tiles varied considerably but most were plain yellow over a white slip, while a few were glazed black or dark green. Five stone pavers in various sizes were located at the south-western end of the room, possibly close to an entrance and a contemporary stepped feature was also found at the north-western end of the room. The tiles have been dated to the late 15th to early 16th century, but the same paving bricks at Hampton Court are thought to be earlier, dated to the 1520’s to 1540’s. We are currently assuming a construction date of between 1510 and 1550. The sunken room was visually and historically interesting enough for the Greenwich Foundation, and their architects, Hugh Broughton Architects, to immediately consider how it could be made visible to the visiting public, a challenging feat considering its location was just at the proposed visitor entrance! However, as the watching brief continued north east of the cellar it revealed first a Tudor wall and then the deeper floors of parts of two vaulted cellars which would originally have had an internal height of about 2m. To date only the interior of one cellar has been revealed, but the external west and south wall of the second has been exposed. Both of these have niches built into them, four smaller ones in the western wall and three larger ones with chamfered divides and horizontal grooves near the base of the niches in the southern wall, possibly for trays. Although the construction of the cellars is stratigraphically earlier than the glazed and tiled floor they most likely to be contemporary. On seeing photographs of these beautiful niches they were immediately identified by staff member Kari Bower as being “Bee Boles” and within a short time she had found the documentary evidence for Tudor bee boles in cellars used for the storing of skeps (straw/wicker hives) during winter. Sheltering bees from extremes of weather, including the winter months is probably as old as bee keeping itself and helps the bees to conserve their energy and food stores. Skeps were an early form of hive made of straw or wicker, but the sheltering of skeps in walls (bee boles) is almost unique to Britain and Ireland, while bee boles constructed in brick walls is concentrated in Kent. While the majority of datable examples are from the seventeenth and eighteenth centuries, Kent has several dating to the fifteenth and sixteenth centuries, three of which are in cellars. (See footnote) The earliest printed reference to wintering bees indoors was published by Gerrard Malynes in 1622 and with a bee wintering instruction by Samuel Hartlib in 1655 which might be taken to refer to using a cellar or an outbuilding. The public access entrance at the Painted Hall in Greenwich is now subject to a redesign to allow both the tiled floor and the cellars with the bee boles to be viewed by the visiting public. Further uncovering of the structures will be required to maximise what can be viewed and interpreted, which will involve further archaeological investigation and recording. As probably a unique opportunity to view Tudor cellars for the winter protection of skeps in bee boles, this promises to be an exciting exhibit. 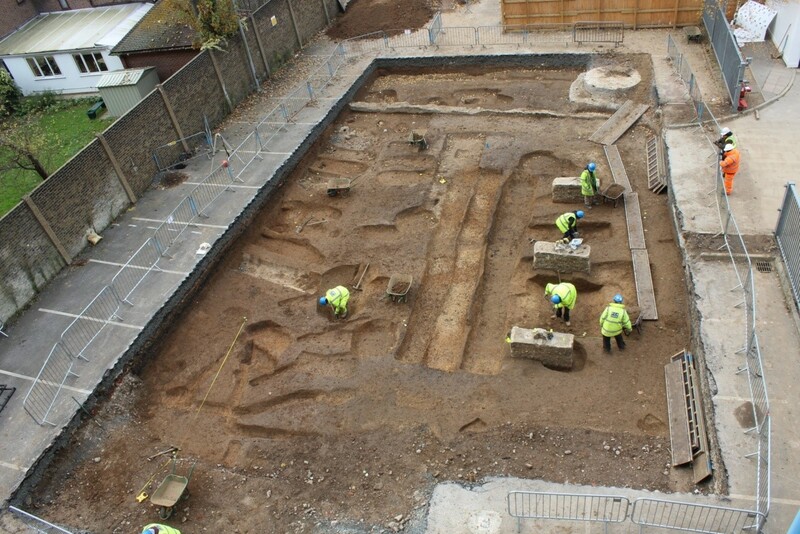 Exciting excavations at Swan Street/Harper Road, Southwark. 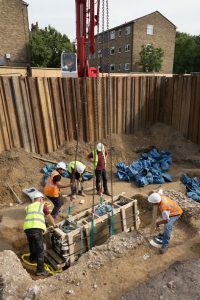 As you might have noticed, there has been a bit of brouhaha regarding the finding of the Roman period sarcophagus in the course of the recent excavations by PCA on a site at the junction of Swan Street and Harper Road in Southwark. However, unless you looked very hard at some of the photographs you would be hard pushed to know PCA had anything to do with it or that there was anything else found other than the sarcophagus. We are now able to provide a bit more detail on the findings at this fascinating site. 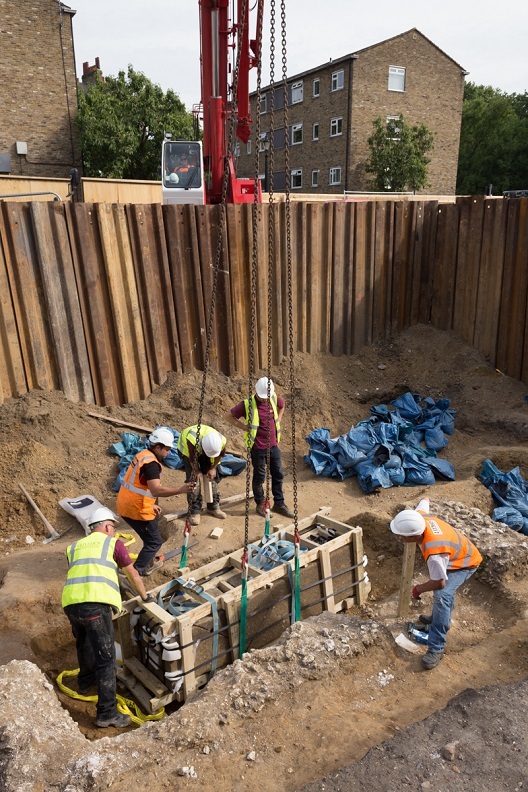 The excavation team from PCA, ably led by Ireneo Grosso, were appointed by CgMs, on behalf of Galliard Homes. The excavations were undertaken in phases over several months and were dovetailed more-or-less seamlessly between the demolition and initial construction works. The site is located within an area referred to as the ‘Southern Cemetery’, although there is no actual evidence that there is a single unified cemetery but probably a number of discrete burial grounds on the periphery of Roman occupation. 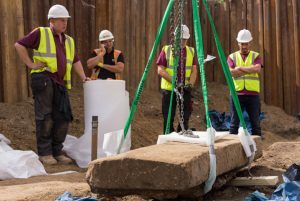 To date approximately 500 Roman period burials have been recovered from the Southern Cemetery area, but until recently not one of them was a stone sarcophagus. Interesting burials abound including the famous Harper Road “princess” and high status mausolea along Great Dover Street, That has clearly now changed. Sadly however, the PCA team were not the first to have discovered the sarcophagus since it was first buried, but it was the first to do it in a controlled and rigorous fashion. It appears that during the process of quarrying chalk from a possible ‘mausoleum’ structure adjacent to the sarcophagus in the 18th century, the massive stone lid prised off and, we assume, the contents at least partially robbed. The lid lay cracked and misaligned, as it was left following this rather less painstaking 18th century investigation! The sarcophagus itself measures approximately 2.4m long, 75cm wide and 65 cm high and (at least) filled with earth. The significant challenge, given that it was directly on the piling line, was to lift the sarcophagus (which already has several significant cracks) out of the excavation area. 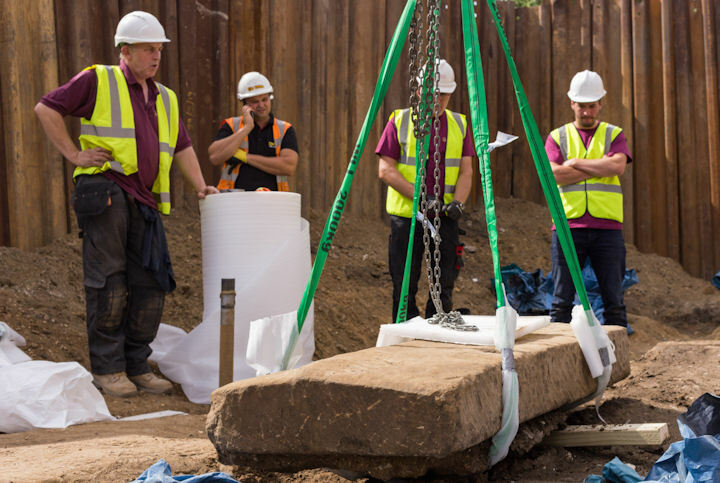 This has been managed successfully by a specialist team including Clivedon Conservation, and the sarcophagus has been taken to the London Archaeological Archive and Research Centre, where the fill will be excavated under controlled conditions. The sarcophagus was by no means the only significant finding of the excavation. A previously unrecorded compacted gravel road, at least 7m wide and flanked on the west side at least by large ditches cut across the site on an approximately NNE-SSW orientation. Roads of this size are considered by the doyen of Roman roads, Ivan Margary, to be in the most important class of roads. It is conceivable, but not proved, that this was part of the elusive London to Chichester road known as Stane Street. If it was Stane Street it is on a different alignment and a little to the east of that traditionally held. However, our understanding of the road infrastructure of Roman Southwark is improving, with many more roads identified within the areas of occupation and the Harper Road example may be another one of these. Towards the western limit of excavation were the chalk foundations of a masonry structure against which the sarcophagus abutted. The structure was parallel to the road, and given this location and relationship, has been interpreted as a mausoleum. 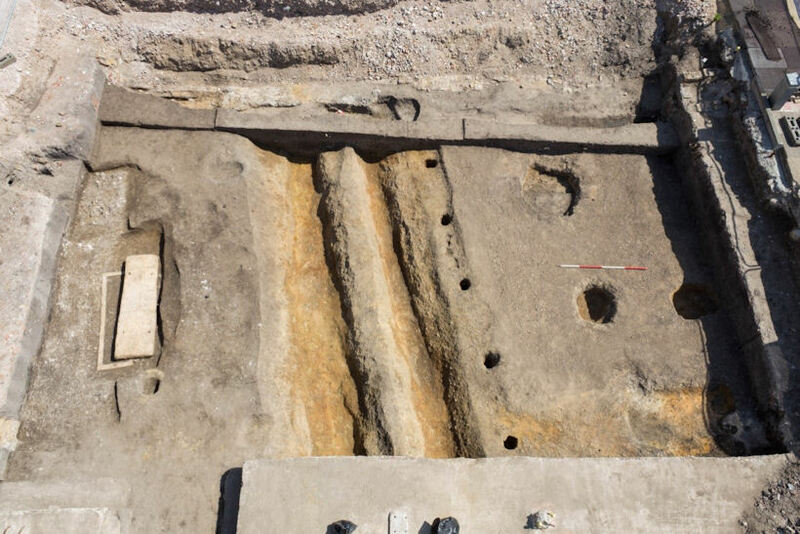 These were relatively high status funerary monuments and only previously identified in Southwark at Great Dover Street, which itself is roughly on the alignment of the Roman London to Richborough road. Moving forward our next steps will be excavating the fills of the coffin. Has it been plundered or and its contents relatively intact? Keep an eye out for further updates on the excavation of the remarkable contents of this extraordinary discovery which has already caused a flurry of excitement in the press..
Due to continued growth and our commitment to deliver projects nationwide, PCA is thrilled to announce the opening of two new offices in the Midlands, providing our clients with greater regional coverage and professional advice second to none. Kevin Trott, formerly PCA Midlands Regional Manager, will now lead the new PCA Newark office, where he will continue to successfully manage projects through to fruition with the support of his highly experienced and motivated team. Tim Bradley, Associate Director, formerly based in our London office is delighted to be heading up the new PCA Warwick office. Tim has been with PCA since 2000, over the years he has built strong links with both clients and archaeological curators across the Midlands and South East regions. He has vast experience in managing a wide range of projects from complex urban regeneration, greenfield developments to industrial sites. Both Kevin and Tim are here to assist you NOW with any heritage requirements that you have, at whatever stage you are in the planning process. Their contact details are below. The expansion continues…new premises in Norfolk!